I wouldn't normally describe my work as Clean and Simple....But today, I ventured outside of my comfort zone again to create this Clean and Simple card using Fifth Avenue Floral and Bella Bleu Designer Paper. 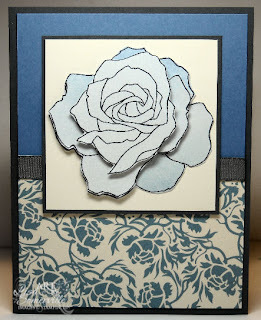 To create the shades of blue on my Rose I used the Spectrum Roll Technique - minus the Spectrum Pad....What's that you ask? Well, since SU doesn't carry the Spectrum Pads any longer, I morphed the technique...I rolled half my brayer in Ballet Blue Ink, the other half in Brocade Blue Ink, spritzed then rolled onto Shimmer card stock. I stamped the rose from Fifth Avenue Floral three times, then cut various parts of the rose and popped them up on the full rose. I love the dimension on the Rose when it's stamped this way. SO pretty!!! A change from your usual style...but I quite like it! Always so inspiring!!!! ...a rose is a rose...as it goes...it's a beauty! Lisa, this is gorgeous. Wonderful job on the rose coloring/shading. Absolutely gorgeous and with this technique perhaps I can stop mourning the loss of the Spectrum pads - nah I'll always regret their loss but the technique should be fun anyway! Great card and technique. Will have to give it a try.